Roy D. Powell lives in Danville, CA in the San Francisco Bay area. 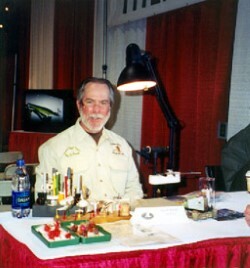 He’s been fly tying well over a decade and considers himself a Pro/Innovator fly tier. His name is published in Frank Amato’s Flyfishing & Tying Journal magazine in the Patent Patterns fly tying contest, where he has won a remarkable 13 times. This year, he says, “I was proud and honored to be asked to join the Daiichi Pro Staff team.” He says, “I have used a lot of hooks for tying, but Daiichi hooks are by far the finest and sharpest.” You can find him at the ISC or the FFF Fly Tying Shows this year and, if you ask, he will whip you up a contest winner on a Daiichi hook. He ll also give you some literature and a sample pack of Daiichi hooks to see what you think -FREE. Catch him at the shows!